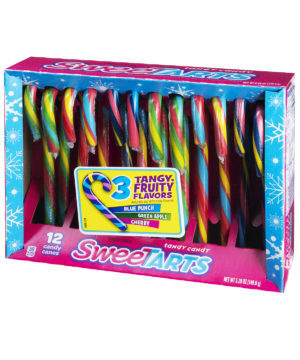 SweeTarts Candy Canes: Sweet and tangy candy canes! Add extra flavor to your holidays with sweets that are more than just sweet! SweeTarts Candy Canes replicate that classic sugary-but-ooooh-just-a-little-sour combination that makes the candy so addictive. The pack contains twelve canes in three flavors: Blue Punch, Green Apple, and Cherry. The multi-colored candy canes will brighten your tree and the fruity, tangy taste will delight your tongue.